Beloved architect Frank Lloyd Wright is best known for his groundbreaking home designs, and while many design aficionados would do just about anything to own a piece of his work, his prices aren’t exactly intended for the masses. Case in point: A three-bedroom, two-bathroom home he had designed hit the market for a whopping $3.5 million in June. But now, you can score Wright’s signature style without ponying up millions, thanks to the Frank Lloyd Wright Foundation’s new collaboration with Amazon. Partnering with various artists and textile manufacturers, the foundation has created an online-only shop offering products that feature the architect’s iconic patterns and prints. So which items in this collection are bound to incite a home decorating flurry and fly off shelves? To find out, we asked design-minded experts to pick out the products they think will sell out fast. Consider this a heads-up to snag a little Frank Lloyd Wright of your own for as little as 25 bucks! These modern pillow covers are available in four designs. 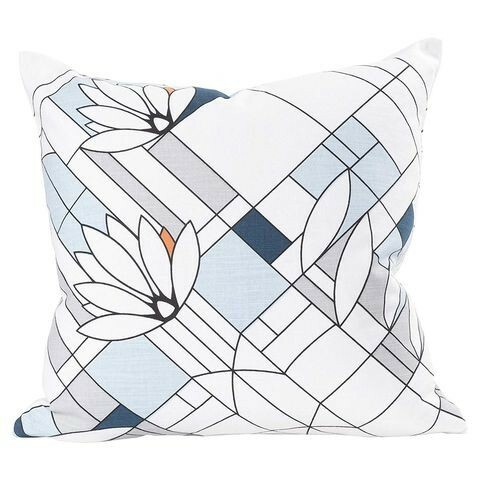 Wright sought to incorporate natural landscape into his designs, and these throw pillow covers ($29.99, amazon.com) combine outdoor inspirations with a printed pattern to add a touch of modern elegance to your home, says Allen Michael, founder of home improvement site HomeViable.com. “The geometric lines and shapes work wonderfully, especially up against a solid-colored couch,” he says. In 1912, Wright constructed the Coonley Playhouse in Riverside, IL, to serve as a small private school, but the building was later converted into a single-family residence. 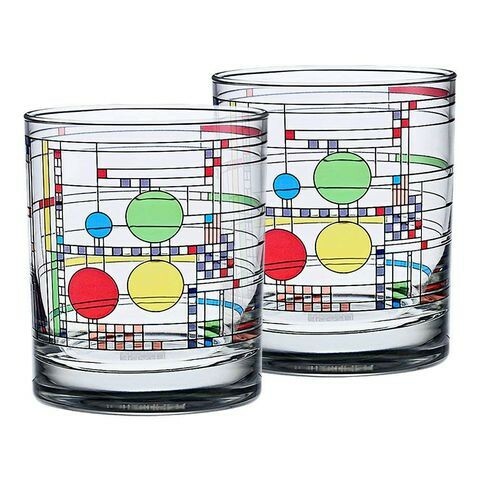 The home’s glass windows include an abstract balloon-and-confetti design, and that print has been replicated on these Old-Fashioned glasses ($27.99, amazon.com). 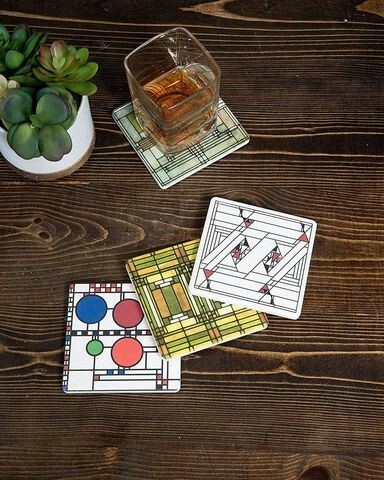 Our design-minded experts can’t get enough of these coasters inspired by Frank Lloyd Wright’s stained-glass window designs. Whether you’re entertaining guests or enjoying an evening nightcap, coasters will save your furniture from spills and water rings. And while coasters aren’t usually high-style items, this multicolored coaster set ($24.95, amazon.com) was inspired by Wright’s captivating use of stained glass in his home designs. “These coasters perfectly emulate this aspect of Wright’s philosophy and will add a modern design flair to almost any table,” Michael adds. This sign is adapted from the lettering style Wright created in 1931. Ryan Taylor, a Canadian real estate professional with West Coast Realty, in Langley, British Columbia, predicts that this “Welcome” sign ($79.99, amazon.com) will fly off the shelves due to its design and versatility. “Whether you are placing it up on a large estate or to an entrance of a small apartment building, this art piece has class and style beyond your typical, new-age hipster style,” Taylor says. He also notes that the sign’s texture and color give it a custom, handmade look—as if Wright had etched it himself! Put this off-white clock in an office or den. While Wright is known for his striking art glass window prints, his unique geometric designs can also add a “wow” factor to your home, Michael notes. And this prism wall clock ($59.57, amazon.com) is no exception. 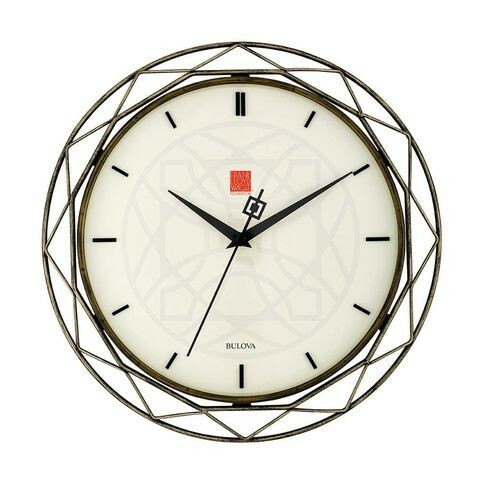 “The understated use of metal surrounding the stylish, stark, white circular clock make it a great addition to a smaller room in your home,” Michael says. He recommends hanging it in an office or den.